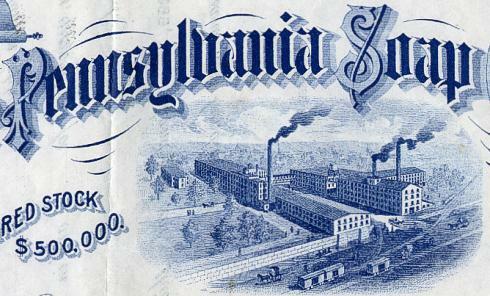 Beautifully engraved certificate from the Pennsylvania Soap Company issued in 1903. This historic document was printed by Wm. Martin Company and has an ornate border around it with a vignette of the company's plant with a train and horse drawn carriages in front. This certificate also has an embossed gold corporate seal. This item has the signatures of the Company's President, C. A. Miller and Secretary, C. G. Engle and is over 113 years old. The certificate was issued to Daniel M. McFarlin. 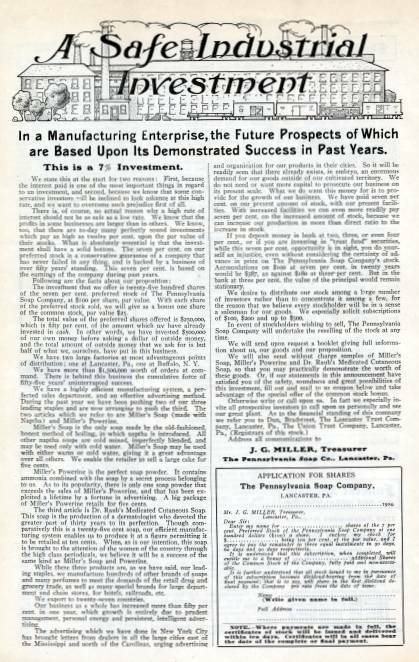 The Pennsylvania Soap Company was the maker of of Miller�s Soaps and Penn-Olive Soap and Tub-o-Foam Chips. Their plant was located in Lancaster, Pennsylvania. In a Manufacturing Enterprise, the Future Prospects of Which are Based Upon Its Demonstrated Success in Past Years. This is a 7% Investment. We state this at the start for two reasons: First, because the interest paid is one of the most important things in regard to an investment, and second, because we know that some conservative investors �ill be inclined to look askance at this high rate, and we want to overcome such prejudice first of all. There is, of course, no actual reason why a high rate of interest should not be as safe as a low rate. We know that the profits in some businesses are larger than in others. We know, too, that there are to-day many perfectly sound investments which pay as high as twelve per cent. upon the par value of their stocks. What is absolutely essential is that the investment shall have a solid bottom. The seven per cent. on our preferred stock is a conservative guarantee of a company that has never failed in any thing, and is backed by a business of over fifty years' standing. This seven per cent. is based on the earnings of the company during past years. The investment that we offer is twenty-five hundred shares of the seven per cent. preferred stock of The Pennsylvania Soap Company, at $100 per share, par value. With each share of the preferred stock sold, we will give as a bonus one share of the common stock, par value $25. The total value of the preferred shares offered is $250,000, which is fifty per cent. of the amount which we have already invested in cash. In other words, we have invested $5oo,000 of our own money before asking a dollar of outside money, and the total amount of outside money that we ask for is but half of what we, ourselves, have put in this business. We have two large factories at most advantageous points of distribution; one at �Lancaster, Pa., one at Buffalo, N. Y. We have more than $1,5oo,000 worth of orders at command. There is behind this business the cumulative force of fifty-five years' uninterrupted success. Miller's Powerine. Miller's Soap is the only soap made by the old-fashioned, honest method of boiling, in which naptha is introduced. All other naptha soaps are cold mixed, imperfectly blended, and may be used only with cold water. Miller's Soap may be used with either warm or cold water, giving it a great advantage over all others. We enable the retailer to sell a large cake for five cents. Miller's Powerine retails for five cents. The third article is Dr. Raub's Medicated Cutaneous Soap. This soap is the production of a dermatologist who devoted the greater part of thirty years to its perfection. Though comparatively this is a twenty-five cent soap, our efficient manufacturing system enables us to produce it at a figure permitting it to be retailed at ten cents. When, as is our intention, this soap is brought to the attention of the women of the country through the high class periodicals, we believe it will be a success of the same kind as Miller's Soap and Powerine. While these three products are. as we have said. our leading staples, we manufacture hundreds of other brands of soaps and many perfumes to meet the demands of the retail drug and grocery trade. as well as many special brands for large depart. merit and chain stores, for hotels, railroads, etc. We export to twenty-seven countries. Our business as a whole has increased more than fifty per cent. in one year, which growth is entirely due to prudent management, personal energy and persistent, intelligent advertising. The advertising which we have done in New York City has brought letters from dealers in all the large cities east of the Mississippi and north of the Carolinas. urging advertising and organization for our products in their cities. So it will he readily seen that there already exists, in embryo, an enormous demand for our goods outside of our cultivated territory. We do not need or want more capital to prosecute our business on its present scale. What we do want this money for is to provide for the growth of our business. We have paid seven per cent. on our present amount of stock, with our present facilities. With increased facilities we can even more readily pay seven per cent. on the increased amount of stock, because we can increase our production in more than direct ratio to the increase in stock. If you deposit money in bank at two, three, or even four per cent., or if you are investing in "trust fund" securities, while this seven per cent. opportunity is in sight, you do yourself an injustice, even without considering the certainty of advance in price on The Pennsylvania Soap Company's stock. Accumulations on $100 at seven per cent. in twenty years would he $387, as against $18o at three-per cent. But in the bank at three per cent. the value of the principal would remain stationary. We desire to distribute our stock among a large number of investors rather than to concentrate it among a few, for the reason that we believe every stockholder will he in a sense a salesman for our goods. We especially solicit subscriptions of $loo, $20o and up to $500. In event of stockholders wishing to sell, The Pennsylvania Soap Company will undertake the reselling of the stock at any time. We will send upon request a booklet giving full information about us, our goods and our proposition. Mr. I. G. MILLER. Treasurer, Lancaster, Pa..
Dear Sir: Enter my name for shares of the 7 per cent. 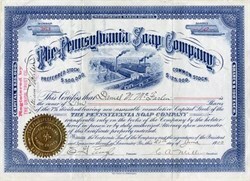 Preferred Stock of the Pennsylvania Soap Company at one hundred dollars ($100) a share. I enclose my check for , being ten per cent. of the par value, and I agree to pay the remainder in three equal instalments in 3o days, 6o days and go days respectively. It is understood that this subscription, when completed, will entitle me to a bonus of additional Shares of the Common Stock of the Company, fully paid and non-assessable. It is further understood that all stock issued to me in pursuance of this subscription becomes dividend bearing front the date of final payment; that is to say, will share in the first dividend declared by the Company pro rata from the date of issue. Name (Write given name in full.) Full Address NOTE.�Where payments are made in tell, the certificates of stock will be issued and delivered within ten days. Certificates will in all cases bear the ante of the complete or final payment.